Unibroue Éphémère Cherry : From a Unibroue mixer 12 pack, because that’s the type of beer quality I serve when hosting larger groups (and always a few local mixers), I was a little hesitant for this on as well I don’t really love cherry flavoured things. 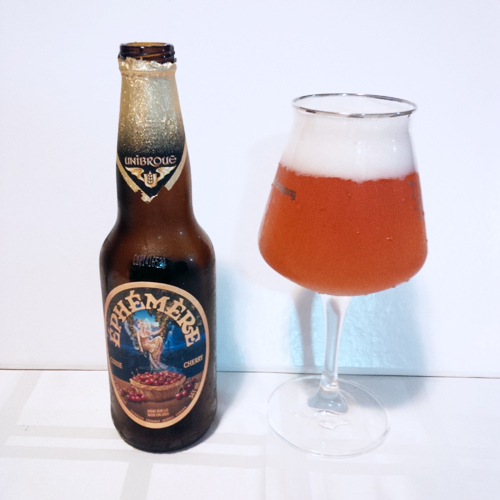 This emphemeral ale (aka lasting for a short time) is brewed at an abv of 5.5% and is released in many different flavours including applemust, cranberry, raspberry and more according to their website. Aroma and Appearance: The colour is a strawberry blonde (ok cherry blonde) and it pours with two fingers of foam with a very carbonated middle. The aroma is cherry tartness, grainy malt and some lemon sourness. Flavour: Like the aroma, it is grainy malt, cherries and a bit of herbal bitterness on the finish. Overall Impression: It is simple, cherry flavoured (not fake cherry, but real cherry) and the fruit flies seemed to love it. Rating: I give it a 5/10, it was average. If you love cherries you may rank this higher than I did. Food Pairing: This would accompany cherry pie nicely, or you could plump some ice cream in it as a float to be different.